Ability to send and receive auto-disappearing photos and videos for groups and friends in Direct. The two new features basically combine the best of Snapchat and Periscope without copying Facebook Live. The Live video helps you connect with followers right now. When you’re done broadcasting, the live story automatically disappears from Instagram. 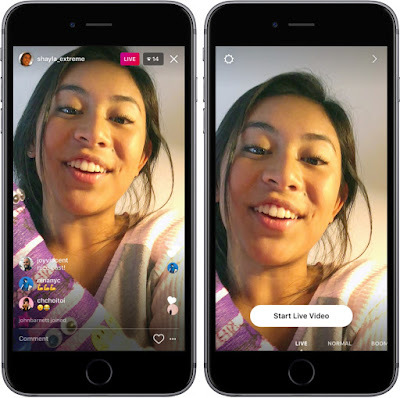 To begin broadcasting live on Instagram, one would swipe right from the feed to launch camera or tap the dedicated Camera button at the bottom, then tap ‘Start Live Video’. Followers would then receive a notification when one is live. The number of viewers appears in the top right of the screen while comments can be see at the bottom. Also while live, one could tap and hold a comment to pin it to the top for everyone to see or turn comments off altogether by tapping the three dots, then select ‘Turn Off Commenting’. It was also said that if one’s Instagram account was recently created, that person may be unable to share a live video.